First revealed artwork for Shenmue III. Promotion picture, by backer Xscape2040. Artwork from YS twitter: Cherry tree in Bailu village. Artwork from KS: Shenhua’s house in Bailu village. 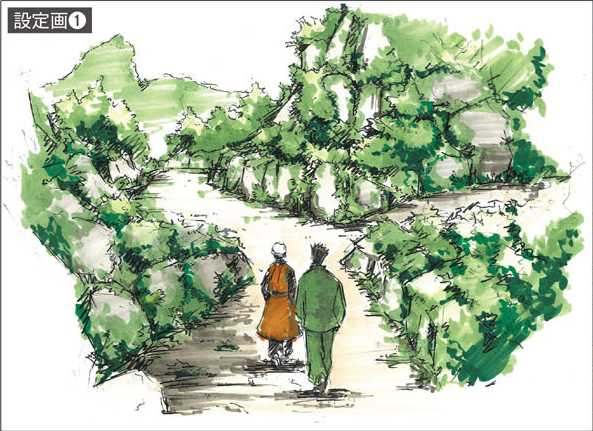 Artwork from KS: Baisha village. Artwork from KS: Choubu village. Artwork from YS Twitter: Choubu passenger boat. From YS twitter: Initial Shenhua design (L) and new design (R). Artwork from YS Twitter: Choubu Hostel (translation by ‘Switch’ at Shenmuedojo). From KS-trailer. Xiuying in the middle, who are the others? From KS-trailer. Shenhua to the right, who are the others? From KS-trailer. Many familiar but also unfamiliar (?) character artworks. Artwork from YS Twitter: Choubu hostel, 2nd floor. Artwork from YS Twitter: Charcoal burner’s hut in Baisha village. Artwork from YS Twitter: Prison. Artwork from YS Twitter: Geyser in Baisha. Famitsu Scan: Ryo and Shenhua on a mountain path. Famitsu Scan: Ryo stakes out Chi-You-Men compound.